Hi everybody! Welcome to another Dispomed video. Today, I’d like to present my new baby the Highdent Quattro Plus. I designed this new machine to meet all the recommendations that the customers have given us in the last years. The first thing, we added a wider shelf, so you have more instrument space. Next, you want to be able to position the handpieces the way you figured it was the easiest for you to work, so you can store your machine with the handpieces back like this, so nobody can hit them and it protects you against percutaneous injuries. Then, when you want to work, you can lean it forward and pull out your handpieces this way. Each handpiece is clearly labelled for proper positioning. Then, you have the controls for the handpieces: the piezo power, the piezo water, the high-speed water. Suction entries can be easily removed for cleaning or sterilization. Add the handpiece here, disconnect the hose here, and you can use the same products that you use to clean all of the tubing on your anesthesia equipment. The tubing is also lighter in weight, much more flexible, and not as hard on the wrist. Your air-water syringe, here you have the selector the on/off switch for the water bottles and you have the selector, the bottles selector since there are two bottles of water here. Next, these two valves control independently the piezo water control and high-speed water. So you don’t have to fill around with your water control all the time they’re both independent. The compressor is the quietest compressor on the market. Approximately 40 decibels in noise level and very long lifespan. These machines are available in 72 different configurations. In addition, you can choose your color. The Highdent range of dental equipment is manufactured in Canada and covered by a full 5-year warranty. 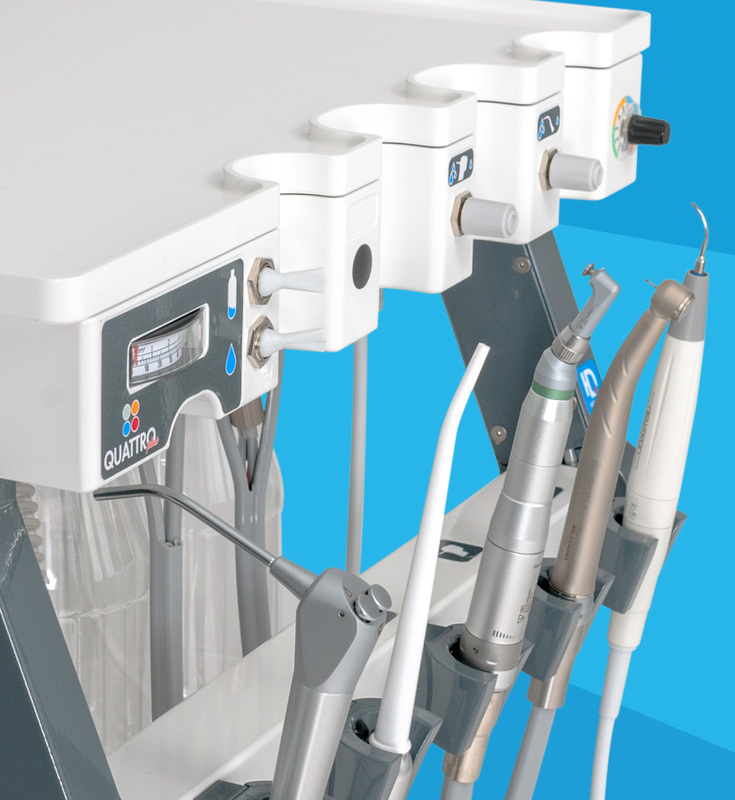 The Quattro Plus is the most complete veterinary dental system with ergonomic features. When designing this unit, the primary goal was to help the veterinarian perform his work quicker, easier and without fatigue.